An article in Arré talks about how nannies – like Taimur’s – are now in the public eye and being appreciated. Just the other day, I was looking at pictures of celebrity kids (who isn’t a sucker for baby pictures?) 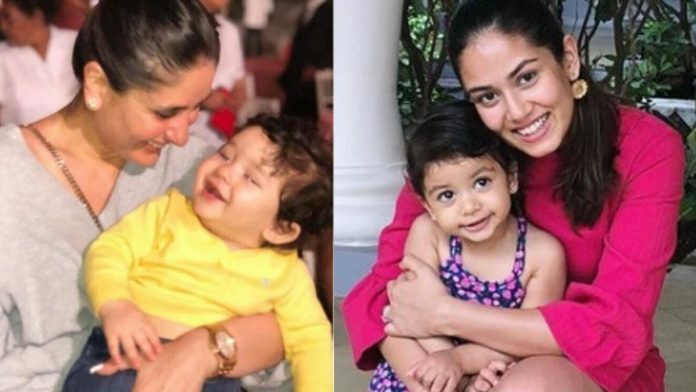 and the image of Shahid Kapoor’s wife Mira Rajput and her two tots caught my attention. The kids were at the airport with their mother, with a couple of nannies in tow – one nanny for each child, I assume. The women were in uniforms – no-nonsense salwar kameezes in a soothing shade of blue, dupattas pinned tidily in place. I wasn’t the only one fascinated by the media initiation of the little Kapoor clan, along with their nannies. Those on my Twitter timeline broke into a debate – parallels were being drawn, not with Taimur and the Kapoor babies, but with their nannies. Kareena did it first, she started the “nanny trend”, said someone. Mira is just aping her, said another. Kareena introduced us to the uniformed nanny, agreed the third. I didn’t want in on this debate, but it made me realise that Bollywood nannies have now turned into mini-celebs themselves. Of course, Savitri, aka Nanny Ali Khan, is the most popular among them. Shutterbugs are always on the look out for her because any signs of Savitri only guarantee that the hours-long wait was worth it and Taimur will make an appearance soon. She generally accompanies the little nawab everywhere – carrying him around to play school and birthday parties, making her the most photographed nanny in India. Savitri is a social media star in her own right, with parody Instagram and Twitter pages – taimur_ki_nanny and @taimurkinanny. Her popularity piqued the curiosity of our media and all the information we need about her – how much she makes, her background – is only a Google search away. Savitri might be giving Bollywood babysitters #nannygoals that Inaaya and Yash-Roohi’s nanny may aspire to, but our uniformed caretakers are no match for those you encounter on Beverly Hills’ Rodeo Drive. These baby-nurses make millions, write tell-all books, and dole out advice to A-listers. Hollywood’s Nannygate is probably the reason why employing nannies is a closely guarded secret. “Celebrities such as Jennifer Lopez and Gwyneth Paltrow, when asked by the press how they find the time to exercise and child rear, say they do it while their children nap. While celebrities often promote their stylists or trainers (or they promote themselves), nannies are classified information, locked into strict confidentiality contracts,” points out a Forbes report titled “Hollywood’s Dirtiest Little Secrets: Nannies”. But it’s no secret that these nannies who work behind the scenes, tidying up celeb toddlers, handling them when they are cranky, make motherhood look so easy for these famous women. With Savitri and other nannies, Bollywood at least seems to be giving them their due – in a way. After all, the way we treat our domestic help will take a long, long time to change. Nannies, who were until now relegated to the kitchen if there was a gathering at home, or stood behind the table while their employers enjoyed a meal at a fancy restaurant, are at least now in the public eye. It might be a while before they eat at the same table or make an appearance in a family picture, but the change is small and, hopefully, in the right direction. If nothing else, there is at least, a public acknowledgement of their labour. Still, I am not sure things are all that different. There’s a clearly drawn-out laxman rekha between the families and the nannies. One surefire way to separate them (especially for the photo ops) is to get these women into uniform. This dress code sends out an unambiguous signal – these women, who cuddle away the kids’ blues, work long shifts, and put their lives on hold for the job, are different. They are required to maintain their distance. With all the wedding bells ringing, new Bollywood babies are likely on their way. Which also means more Bollywood nannies. Like Savitri, some of them might even get their share of the spotlight. But the Indian nanny, however smart her uniform, might always remain who she is. Not a part of the family, but hired help. Madhuri is a bestselling author, known for her novels Manhattan Mango and The Strongman’s Daughter, as well as her Supermom Cookbook for working mothers.